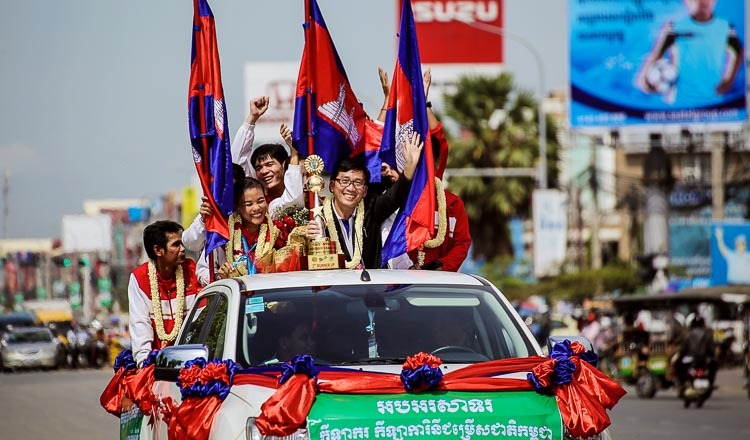 Cambodia finished third in the overall standings, behind Vietnam and Algeria, in the 45-nation competition in New Delhi and captured an unprecedented four gold, nine silver and nine bronze medals. “In more than 10 years, Cambodia has never won so many medals,” said Vath Chamroeun, the secretary general of the National Olympic Committee of Cambodia who was part of the welcoming committee. “As part of the plan for the SEA Games, which Cambodia will host in 2023, we have to make sure our level is up there with our Asean neighbours. “But now we know that we can also claim world-class medals and that Cambodia’s athletes can do it on the international stage,” he added. Vovinam is a Vietnamese martial art in which fighters use kicks, grapples, throws and even weapons. Unlike taekwondo, the Korean martial art, it is not yet recognised as an Olympic sport and as a result receives little funding. However, both NagaWorld and Prime Minister Hun Sen have continued to acknowledge the success of Cambodia’s Vovinam athletes. In 2016, Sen Rady won the Male Athlete of the Year grand prize at the NagaWorld Sports Awards. Rady, also known as Tin Pheap, beat the likes of football darling Chan Vathanaka and a host of other contenders thanks to his gold-medal winning display at the 2015 Vovinam Championships in Algiers. He had earlier received $30,000 from the allocated government fund for sporting excellence as well as a $10,000 personal contribution from the prime minister after his return from the competition in August 2015. Mr Hun Sen reacted to this latest win for Cambodian sports with a congratulatory Facebook post. “Congratulations to Cambodian players for the 2017 gold medal,” said his post on Facebook.